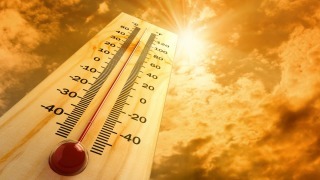 The heat wave continues: D.C. reached the 90s for the sixth day in a row Tuesday, with the heat index soaring past 100 degrees due to humidity. Expect isolated rain Tuesday evening with possibly damaging winds between 5 and 7 p.m., according Storm Team4. The main threat will be in Northern Virginia. The metro area can expect a break from the hot weather soon, with a cool front moving in that will drop temperatures to the mid-80s Wednesday, getting much closer to the average for this time of year. 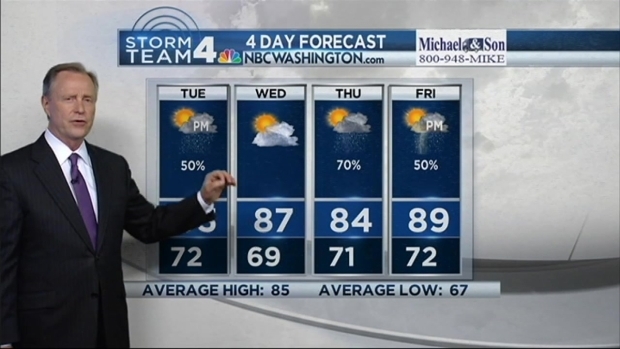 Storm Team 4 Meteorologist Tom Kierein has the forecast for Tuesday, June 16. The cool front is also expected to trigger thunderstorms that will continue throughout the week. By Friday and Saturday, we'll also be feeling the effects of Tropical Storm Bill. The storm hit Texas on Tuesday with heavy rainfall. It will move through the central part of the country before moving east, hitting the metro area with tropical downpours but no damaging wind at the end of the week.